The School to Prison Pipeline is important to me because I’m raising a Young BLACK male student in the American school system. 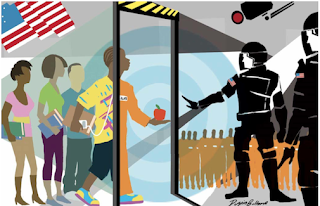 I’ve seen first-hand how a Black male child student, can be demonized and assigned adult punishments for child-like behavior just because of his skin. It’s a sad reality to watch and experience. 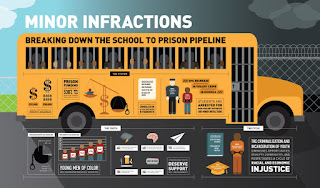 Pushing students out of school and straight into the prison industrial complex is what the School to Prison Pipeline is. Targeting students of color is a real practice. Why? Because prisons are being built and someone has to fill them up. How does it happen? Well, it starts in the classroom, when teachers overreact to minor infractions. Like, the student who sleeps in class. Grant it, the student is asleep, but did the teacher talk with the student to find out why? Chances are, the teacher automatically writes the student up, or kicks the student out of the classroom. Zero tolerance policies play a major role in the push-out of students. For example, a student disagrees with their teacher, instead of the teacher engaging in open dialogue as to why the student disagrees, the teacher will call the student insubordinate and then kick them out of school. Lastly, how the teacher chooses to handle students that they feel are inferior. The lack of cultural competence among K-12 educators allows prejudice and fear to guide their decisions. Therefore, further disengaging students and pushing them into the school to prison pipeline so that corporations can get free labor and continue the cycle of slavery. Ahhhh the sweet taste of CAPITALISM!